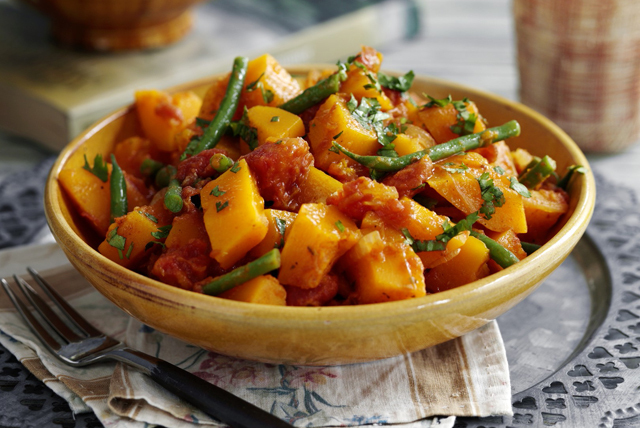 Veggie packed and full of flavour, this simple Sweet Potato and Green Bean Curry is a recipe that you need to try. Requiring just 30 minutes to prepare, this satisfying dish features the perfect balance of flavours. Heat dressing in medium saucepan on medium heat. Add onions; cook and stir 4 min. Stir in garam masala; cook 1 min. Add potatoes and tomatoes; stir. Cover; simmer 15 min., stirring occasionally. Stir in beans; cook 5 min. or until potatoes are tender. Sprinkle with cilantro. Serve over hot cooked basmati rice. Prepare using regular green beans, increasing the cooking time as needed until beans are tender.